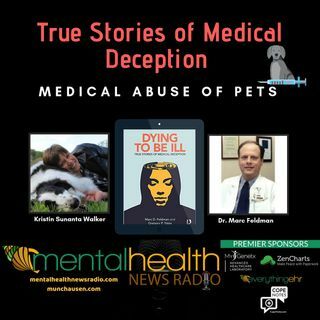 Join Dr. Marc Feldman and retired dog breeder "Styles Bennet" to discuss Munchausen by Proxy in cases where animals are medically abused so their owners can garner attention. Marc D. Feldman, M.D. is Clinical Professor of Psychiatry and Adjunct Professor of Psychology, the University of Alabama (UA), Tuscaloosa, Alabama. A Distinguished Fellow of the American Psychiatric Association, he is the author of more than 100 peer-reviewed articles in the professional literature. Dr. Feldman ... See More is an international expert in factitious disorder, Munchausen syndrome, Munchausen by proxy, and malingering, and his credits include five books including Dying to be Ill.